Applicants, if you have the eligibility criteria of the GPSC State Tax Inspector Recruitment 2019 then apply now. Gujarat State Tax Inspector Notification of 200 Vacancy was attached in this page along with the details. Particulars referred postulants can apply online @ojas.gujarat.gov.in or gpsc.gujarat.gov.in up to the end of 18th April 2019. Candidates who confidently know that they are eligible to appear for the GPSC State Tax Inspector Recruitment Process, then only have to fill this form. From this page, postulants will know all the eligibility criteria, salary details and the link of the application form. GPSC 200 State Inspector Vacancy in Gujarat state has been informed to all the contenders from the OJAS Page. Any candidate with a minimum qualification of Bachelor degree can attain this state Govt job position in Gujarat state. 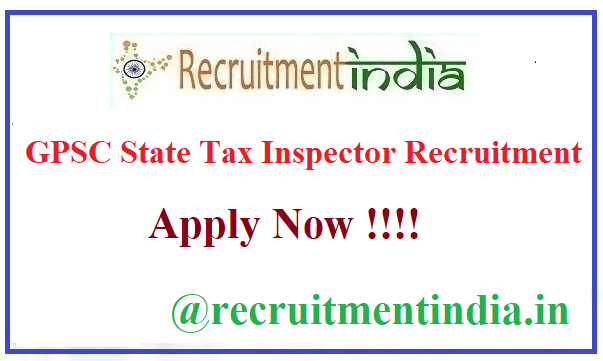 Now candidates check out the full details of the GPSC State Tax Inspector Recruitment 2019 to have the information of what is required to apply for this notification. As per the requirements are given by the officials in the Gujarat State Tax Inspector Notification, postulants have to send the details filled forms from 18th March 2019 to 18th April 2019. For the candidates who gave the forms in between these dates only will be accepted by the board and the opportunity of participation in the selection process of the gpsc-ojas.gujarat.gov.in Recruitment. Under the Gujarat Public Service Commission organization, the state government has started the search of well-deserved candidates for the GPSC State Tax Inspector Recruitment 2019. All the conditions mentioned in the employment notification agreed candidates can do the enrollment of details. But to be in the selected candidate’s list, postulants have to prepare the GPSC State Tax Inspector Syllabus that is available on our page. Officials have given a very detailed format of notification about GPSC State Tax Inspector Vacancy Notification. In the notification only, candidates will get the selection process of the GPSC STI Recruitment. For these 200 posts, the candidates should have the educational qualifications exactly mentions in the notification. So check the exact academic qualifications from this page. Any Bachelor’s degree obtained from any of the recognized University. For this GPSC State Tax Inspector Vacancy, the selection process is mentioned in the Notification. First Five Years Of Service: Rs.38,090/- PM Which if Fixed. To apply for this GPSC State Tax Inspector Recruitment 2019, candidates need to pay any application fees. In Gujarat state, in the respective department of State Tax Inspector, there are 200 vacancy positions. Those vacancy positions to be occupied by only talented candidates. So the GPSC in order to select only the talented candidates conducting the selection process to the eligibility criteria met candidates. Firstly, GPSC said to submit the GPSC State Tax Inspector Application Form to the candidates who completely understood all the rules and regulations given in the GPSC 200 State Tax Inspector Vacancy Notification 2019. The use of this notification release is for making understand of all the details of the GPSC State Tax Inspector Recruitment 2019. Any Govt departments in Gujarat state application filling process will be done through the OJAS page. So GPSC State Tax Inspector Application Form process is available in the Ojas portal only. Then candidates take the step of application filling from 18th March 2019 to 18th April 2019. In the said dates only officials will take your application process. Other than these dates, candidates have lost the opportunity to Apply Online for Gujarat PSC State Tax Inspector Vacancy @ojas.gujarat.gov.in from this web page @ recruitmentindia.in. Before this last date, candidates have to submit the application form. Postulants who felt this post as useful they can fill the registration form from the below direct link. Sir due to some unavoidable circumstances I was not able to pay challn and now exam date is postpone soo I have to pay fees of it please help me sir ..